Recently we did a deep dive into the Zotac GeForce GTX 170Ti Mini and walked away extremely impressed with what that small form-factor video card could do. So much so, and as we made note in that review, that it has dramatically improved our opinion on small form-factor high performance cards. 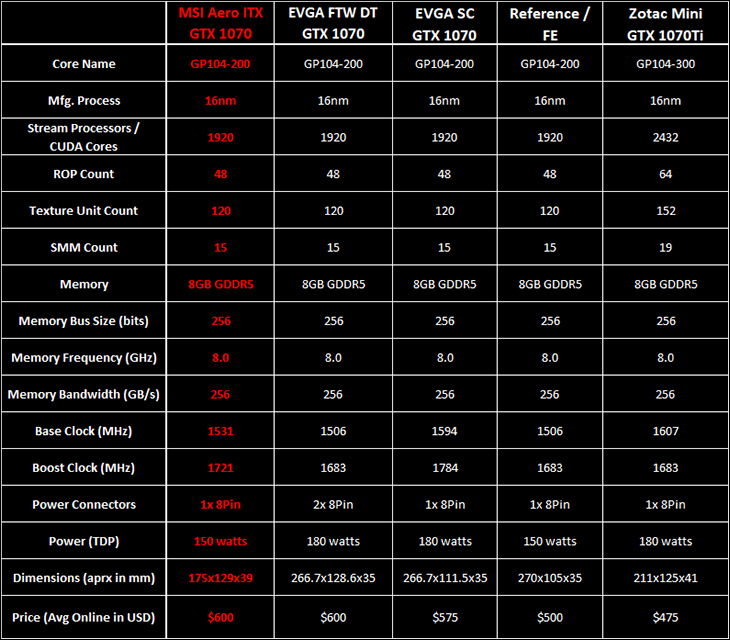 This does however beg the question on what other manufactures can do in this corner of the market and if they can measure up to the awfully high bar that Zotac has set. 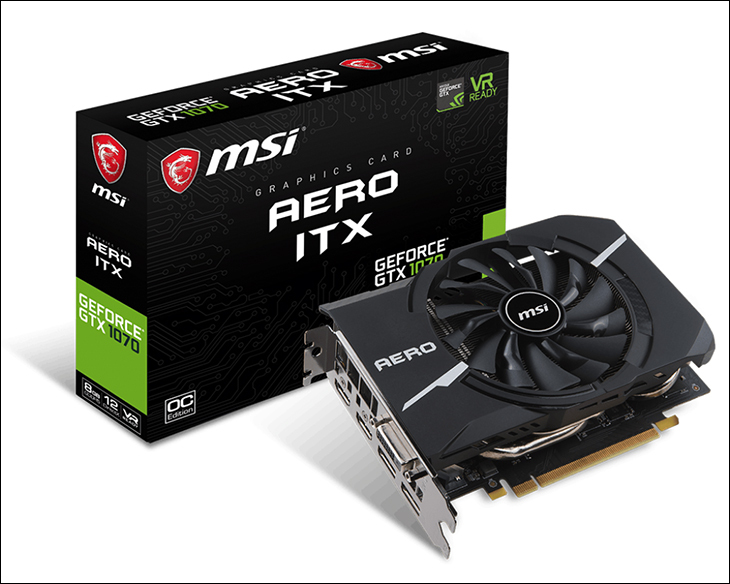 Today we will be taking a close look at the MSI GeForce GTX 1070 Aero ITX OC. As the name suggests this particular card has been created with ‘shoe box’ sized ITX cases in mind; however, this incredibly small (for a GTX 1070) card is not clocked like a ‘Founders Edition’ GTX 1070. Instead MSI has not only created one of the smallest GTX 1070’s ever, it comes factory overclocked to 1531MHz with a boost of 1721MHz (instead of 1506/1683). That is indeed impressive consider this pixel crushing performance comes in a in a package that is only 175mm by 129mm by 39mm. Compared to the Zotac GTX 1070Ti Mini’s size of 211x125x41 that is nearly an overall reduction of 17 percent! In order to offer buyers both a small form-factor and a relatively high factory overclock MSI did have to create an entirely new custom heatsink. To this end they took their larger ‘ZeroFrozr’ design and started trimming the dimensions… and trimming… and trimming. The obvious downside to making this card so small is that along with a much, much less capable heatsink is that it only has room for one 100mm fan compared to the two (albeit smaller) fans that Zotac uses on their Mini model. Does this decrease in cooling potential in both the heatsink size and cubic feet of air movement per minute translate into noticeably decreased performance? Or like Zotac’s design simply mean that any loss in potential performance will never be noticed by the average consumer? This is the benchmark we will be using to judge the MSI GTX 1070 Aero ITX OC. Without giving too much away this is benchmark that the Aero fails to live up to expectations… in more ways than one.